It’s no secret that I am a big Trader Joe’s fan. I brave the crowds frequently to stock up on items that are unbeatable for both price and quality. One of my latest discoveries is not new to the brand, but it is new to me and it is life-changing. One word. Mirepoix. 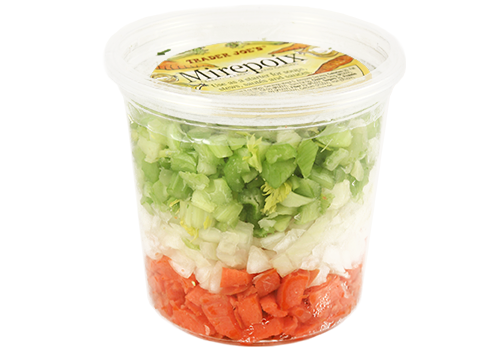 Mirepoix (meer – pwah) is a staple in the French culinary world, consisting of diced onion, carrot and celery, which provides the base for soups, stews, and sauces. It takes a bit of an effort to make, due to the washing, peeling, and dicing of the vegetables. Trader Joe’s offers it in a 14 oz tub, layered with the perfect proportion of one-half onion, three carrots, and 3 celery stalks, all cut and ready to use. In the time it took to unpack my groceries, I had sauteed the Mirepoix and was ready to add the other ingredients for a quick pureed soup. And did I mention it’s only $2.99? Slowly saute the mirepoix in butter or olive oil, until the vegetables start to soften, and the onion becomes translucent. True mirepoix is not meant to brown or caramelize. Add the vegetable of choice, (zucchini, cauliflower, and broccoli are all good options) and any herbs you might like. Add enough chicken or vegetable stock* to fully submerge the vegetables and simmer covered until they are soft. Puree the mixture until smooth, put it back in the pot, correct seasonings and enjoy! * If you don’t have stock on hand, Better Than Bouillion is another easy fix. It comes in a jar and is spoonable, rather than dehydrated into a salty cube. It is organic, not full of fake ingredients, and a big dollop added to the pot of water makes a tasty soup. It is high in sodium, so be sure to taste before adding additional salt. This entry was posted on October 10, 2017 at 6:51 am and is filed under Food. You can follow any responses to this entry through the RSS 2.0 feed. You can leave a response, or trackback from your own site.